A quick and easy Thai dessert, popularly served in road side shops and restaurants in Thailand. Very ideal dessert for any parties and potlucks as it does not involve much cooking time and can be served at room temperature. 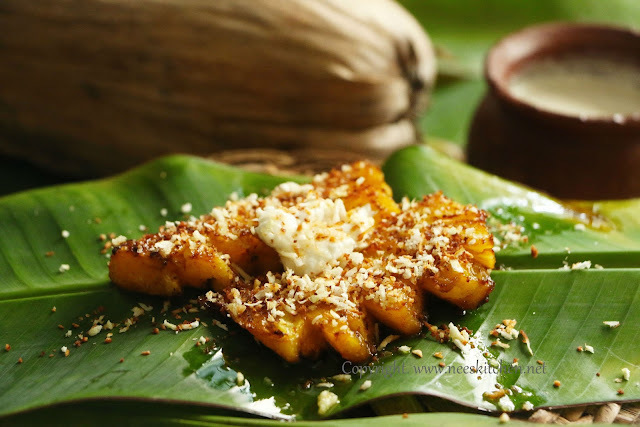 It also does not need any region specific ingredients except for the palm sugar which can be replaced with normal sugar. 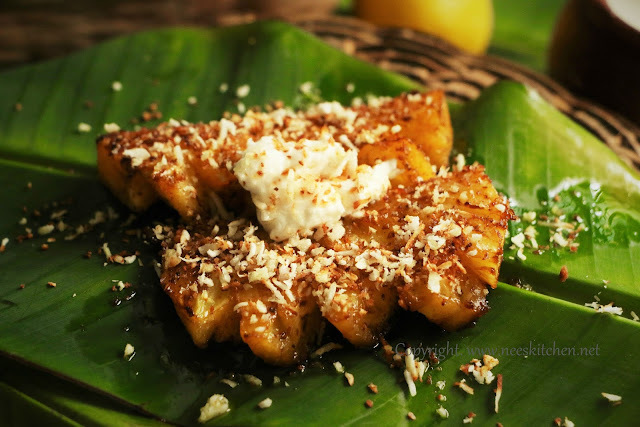 The sharp taste of the pineapple and the sweet taste of gula melaka (coconut palm sugar) make it very refreshing dessert at the end of a meal. Make sure the pineapple is completely ripened. Traditionally coconut palm sugar is used however this can be replaced with brown sugar or processed sugar. If the pineapple is too sweet you can omit the sugar completely. It is shallow fried in butter hence if you are a diet watcher be cautious on the diet. Do not omit the dollop of yogurt which is added at the end as it gives a good taste. 1. Take a pineapple and cut into 6 slices each with 7cm long & 3 cm width. 3. Heat butter in a large and heavy frying pan and let it melt completely. 4. Place the pineapple slices in the melted butter, sprinkle palm sugar and lemon juice. Flip them immediately once so that the palm sugar and lemon juice gets mixed in both the sides. 5. Cook the pineapple, stirring and flipping at regular intervals until the palm sugar is dissolved. 6. Once the palm sugar is dissolved keep it for 3 minutes on each side so that the pineapple is fried nicely. 7. Place 2 pineapples in each bowl and add a dollop of fresh and creamy yogurt. 8. 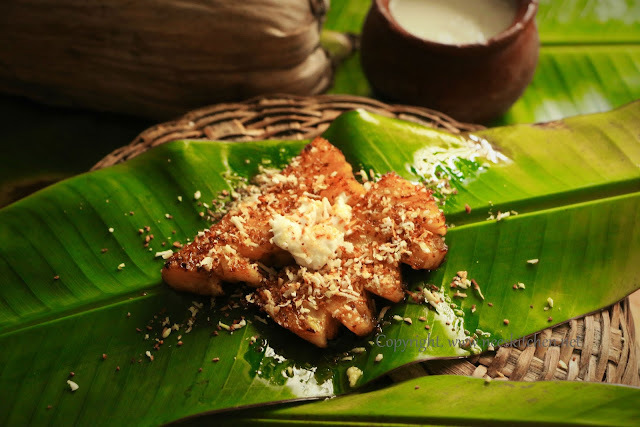 Sprinkle with fried coconut and serve. Length of the pineapple can be longer but be careful while flipping as it might break.